We're going to start adding book reviews to the blog when we can. We receive enough questions about the topic that it seems like it would be helpful :) (and besides, sometimes it's just plain fun!). In the interest of full disclosure - We were introduced to the book below by Nancy & David's publicist. We are not, however, being paid for the review (but will make a commission on any Amazon sales generated if you click the link at the bottom to buy the book). So, hint, hint, if you do decide to buy the book, please do so through us :) Thanks!! A special thanks to Aimee Wisyanski for writing this review! It was not so long ago in American history, that prominent American families sent their sons to become officers and leaders in the United States military. Today, only 1% of American society is currently serving in the military and on the front lines of the War on Terror. 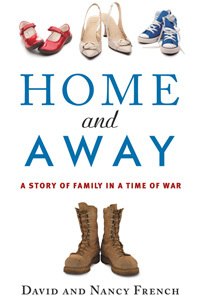 Home and Away is the story of a husband, father, and lawyer with a degree from Harvard, who heeded the call to serve when he read about a man and father his age being wounded in Iraq. No one probably thinks much of a lawyer going off to war. When we think of lawyers, we think of ambulance chasers or the prosecutors on Law and Order. It would be easy to take this book with a grain of salt and think, a lawyer went to Iraq, so what? However, Home and Away shows the important role that lawyers play in the prosecution of military action; they help soldiers with legal issues, advise commanders and individual soldiers on the rules of engagement, and as David French did, run detainee operations to ensure the fair treatment of enemy prisoners of war. But the themes in this book transcend the story of a lawyer at war while his family stays behind. The book tells the story of a family at war and the struggles and challenges that all military families go through when one member of the family unit is deployed in a combat zone. The story in Home and Away is unique in that it tells the story of both sides of the equation when a soldier goes off to war; from the perspective of the soldier himself and from the perspective of his wife. On one side we read about David’s experiences as a soldier on the ground in Iraq; his fear when traveling down roads known for IEDs, the camaraderie and affection for his fellow soldiers, and unfortunately, the pain of losing friends on the battlefield. From Nancy we see the struggles of raising children alone and trying to work and maintain her own identity, helping the children through the fears about their father’s safety, and her own personal struggle of battling a sense of uncertainty, but rising above those challenges to become independent in dealing with everyday issues of life, such as the break down of a car or dealing with the family finances. The tale of David and Nancy are experiences with which all military families can identify and understand as it portrays the sacrifices, fears, and difficulties of deployments to combat zones. The book would be useful for the 99% of society that is not serving to read, as it shows what is behind every service member’s call to serve their country; a sense of duty and patriotism, but most of all, the desire to serve with their brothers and sisters in arms. Home and Away also shows through Nancy, the uneasiness about a spouse’s decision to serve in the military, especially in a combat zone and her decision to support her husband despite her unease. A lot of military wives can sympathize with Nancy’s feelings, especially the wives and spouses of those who chose to sign up for military service following 9/11. By the end of the book the reader sees the difficulty in keeping a family together across great distances and long deployments, which will garner more understanding in readers who do not or have not served in the military. Home and Away is definitely recommended reading for the everyday reader!